Summer break is one of the most popular times for families to vacation to Branson. From shows to attractions, there are numerous options for families to have a good time. Branson offers a wide variety of shows that families enjoy. 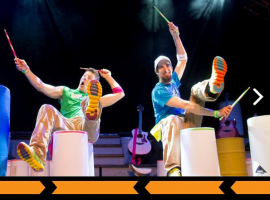 A few of the top family shows in town include: Amazing Pets at Grand Country Music Hall, Buckets and Boards at the Starlite Theatre, and the Dixie Stampede! There are also a lot of attractions that will make the entire family happy. These include: Branson’s Segway and Adventure Center, Branson’s Runaway Mountain Coaster, and Silver Dollar City. When the family gets hungry, there are several restaurants that offer family-friendly dining experiences. Cici’s Pizza Buffet and Papa Grand’s Pizza buffet offer a full pizza buffet and an arcade for the whole family to enjoy. From amazing shows to awesome attractions and dining, Branson is definitely a great place to visit on summer break!